November 5, 2013 Dan O. We got Bobby, but now, here’s Johnny! Sort of. When JFK was assassinated in Texas, the whole nation was left in a widespread panic of not knowing what to do next, how to pick themselves up from such tragedy and what would be the best way to move on. But before any picking up and moving on could be done, there had to be some simple procedures done, like finding out who killed JFK, who that killer’s family was, who the person filming the incidence was, how they can keep it away from the media, an so on and so forth. Basically, this is a look inside the various lives that were affected after JFK’s murder, and how most of them coped with the disaster in many different ways, sometimes some were more positive than others. But the ones who were negative, they really were hit hard, as you’ll soon see. The JFK assassination is something that no matter what type of person you are, history buff or not, will always interest you. All controversies about whom did it, why and whom with, there are still some very interesting facts about it that many of us have yet to even know about, while some are still being unearthed. It’s strange to think that even 50 years after the fact that we’re still getting bits and pieces of info about what really happened, who was behind it and possibly just if it was all a ruse or not, is really surprising. However, one must remember that it’s the U.S. government we’re dealing with here, folks. They can’t always be trusted. About to have themselves a bloody good time…….. What? Too soon? Anyway, those said interesting little facts about this well-known assassination is probably what does this flick some good in the first place. For starters, it gives us a glimpse inside the lives of a bunch of people we’d never expect to see get a movie made about and it actually allows them to have their story shown. Some get better than treatment than others, but overall, everybody here has a story to tell, and they are all somewhat worth watching and paying attention to, even if the direction doesn’t quite follow suit with that the whole way through. Some have been having problems with this movie because it’s considered “overstuffed” and “jammed”, and I can’t say I disagree. With a movie that runs just about under an-hour-and-a-half, showing all of these stories, with all of these different, familiar-faces, definitely does come across as “too much to take in”, especially when you pretty much know that the material would benefit a lot more from something like a miniseries or hell, even a longer movie. The stories that are interesting get the most attention here, but the others that don’t, still feel like they have something that we would want to see or take notice of, yet, they aren’t really given much time of the day. For instance, there’s this one story the movie focuses on that features Ron Livingston playing an FBI agent that knows all about what’s happening with the president, who killed him and where they can nab him, but we never actually see him go out onto the field, actually gathering info, clues, hints, or anything else that would probably help him get a clearer view of the case. This subplot also leaves more questions than actual answers as it becomes clearly evident that the movie, in some way, shape or form, is suggesting that Oswald didn’t act alone and had to have some outside-help in order to kill the president. Personally, I agree with this sentiment, but I feel like when you have a movie that’s dedicating its legacy to an event, as well as to a public, iconic figure no less, that it may not be right to choose sides. Then again, I’m always down for when things get shaken around a bit, so who the hell am I to even talk, you know? Other than Livingston’s character’s story, there are plenty of other ones to that get the light of day, most are a lot more interesting than the one I just mentioned, and some far more deserving of their own movie or hell, one-hour running-time. The one story I’m mainly talking about is the one in which James Badge Dale plays Oswald’s brother that somehow gets wrapped up into all of this, all because he shares the same last name as the man who killed the president. The movie paints a nice picture of this conflicted man who knows what his brother did was wrong, and yet, still can’t bring himself away from totally abandoning him and leaving him out to dry. Because honestly, let’s face it: Family is family, no matter what. Dale is not only great in this role, as he is in all of the 50 movies he’s shown up in in the past two years, and really gives you the sense that this is a good-natured citizen who knows what’s right, and what’s wrong, and yet, still can’t help but get thrown under the bus all because of who his brother is and the dirty act he committed. While Dale’s performance is very nuanced and subtle for this type of material, Jacki Weaver, playing Oswald’s crazed attention-whore-of-a-mother, is a little more nutty and over-the-top, but is still worth watching because if you watch any of the interviews with the real-life figure, you’ll see that she more than just hits the nail on the head. She absolutely bangs it in with utter force. The rest of this studded-ensemble is a bit of a mix-bag, which is less of their fault, and more of the film’s because it doesn’t quite utilize their skills as well as it should have, which is a damn shame, considering the type of true talent we have on-deck here. Colin Hanks, Zac Efron and Marcia Gay Harden all play the nurses and doctors that examine both JFK one day, and Oswald the other, which gives us a nice contrast between the two, even though the characters themselves are never fully sketched-out to be more than scared fellas and gals. They all try, but their characters are thin. Billy Bob Thornton gets a chance to show up on screen and do his bit for a short while as the FBI agent assigned to figuring out what happened here and how they can fix it all up in a neat and tidy bow. Nice to see Thornton do something where he isn’t either a total and complete a-hole, or for that matter, a total and complete dirtball that has no sense of normal hygiene or normalcy. The one who I was most surprised by, not because he was bad or anything, but by how uninteresting his story actually was, was Paul Giamatti as Abraham Zapruder who, if you don’t know by now, was the poor individual who had the displeasure (or pleasure, in some crazy mofo’s minds) of not only filming the assassination, but to be the one the media and FBI came to first, throwing away any price he would deem desirable. Giamatti is great in this role, as usual, giving us a distraught, scared old man that doesn’t quite know what to do with himself for the time being, but definitely doesn’t want to wake up and smell all of the real harsh realities that the world brings. While I felt these sad, emotional connections coming from Giamatti’s performance, I never quite felt that for his story, which actually felt like it could have been given its own movie, and maybe even be up for some Oscars along the way as well. However, we may never get to see that happen. And if we do, it won’t be with Giamatti. Poor guy. He so deserves better. And don’t even get me started on Jackie Earle Haley as the priest who gives his final blessing to JFK’s corpse. It’s one of those blink-and-you’ll-miss-it roles, and is by far one of the strangest aspects of this whole cast. Heck, I’ll even go so far as to say the movie as well. 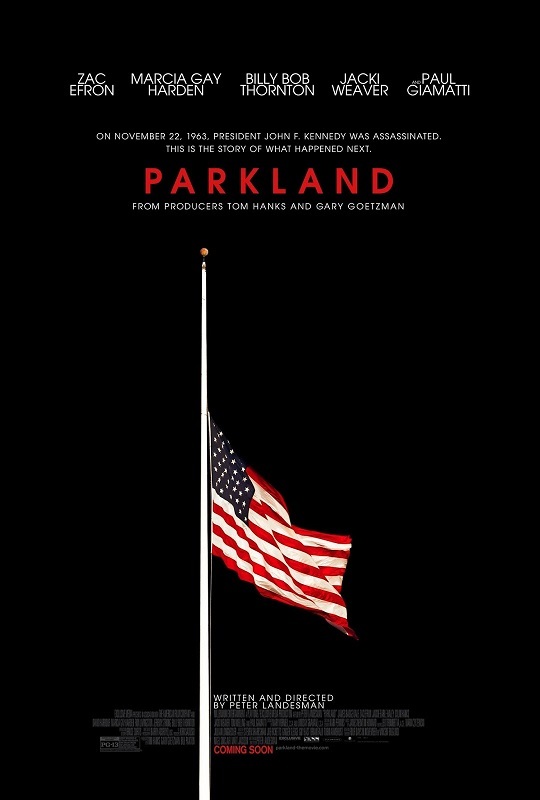 Consensus: The approach Parkland brings to its infamous event, surely is one of the far more interesting aspects going for it, but can’t help but feel disappointing once you realize how under-cooked, short and jammed-up it is, and even worse, it didn’t need to be either. How he didn’t receive an Oscar for Best Documentary short that year is totally beyond me……What?!?! Once again, too soon!??! Good write up. Your review made me feel less guilty about not going across the city to see it at the ONE theatre it was actually playing at here. I really want to see this though because I have always admired Kennedy, but now I have to wait for it to come out on Netflix or video on demand. Great review. I have always been fascinated by Kennedy, so I would have to check this out. Will check it out someday I hope! This entire review is TOO SOON!!! LOL!!! Seriously, though, is this a film we really needed? Really? I don’t think so. I’ll check it out but only if there’s nothing else in the queue. This film made me so nauseous from all the shaky-cam movement. A bummer as I thought the premise was intriguing.